Even though I miss my summer birds—the hummingbirds, finches, thrushes and phoebes—I’m happy to turn my attention to those who keep us company over the winter. Today I filled all the bird feeders, added new suet and watched the hardy little birds flock to the feeders. We have a variety that call our yard home in the winter, with Chickadees, Dark-Eyed Juncos, Tufted Titmouse and Cameron’s personal favorite, the White-Breasted Nuthatch, dominating the feeders. Today’s snow flurries made for a lovely white backdrop as the birds flitted back and forth to the feeders. We even enjoyed watching a large Red-Bellied Woodpecker who stopped by the front yard to feed on the suet. 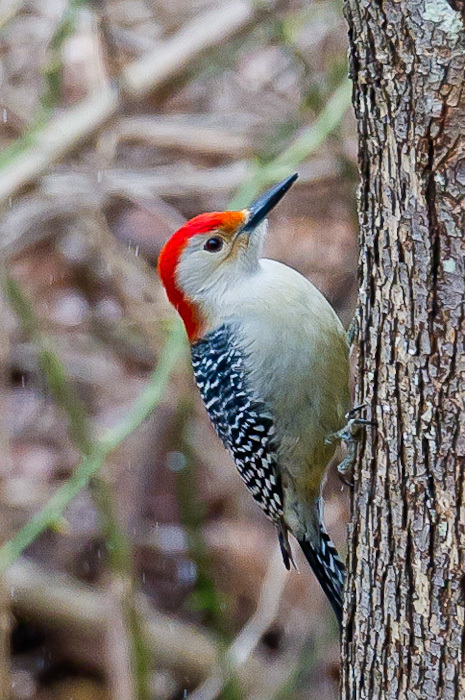 He added a beautiful splash of red to the otherwise more mundane background and paused several times on the side of a tree, seeming to model for my camera—perhaps as a way to say thank you for his special winter treat. Thanks! I’m glad he decided to pose for me! I love woodpeckers! They have an almost comical charm!